Nine weeks ago we left our home to travel the world for several months with our two teenage children – Ian 19 and Lily 16. During the four year planning and saving process, we came across many different opinions about our decision to undertake such an adventure ranging from fascination to jealousy to disdain, but what surprised us the most was how many people responded with reasons why they could never take a trip like this. The “I would love to do that, but…” responses were varied and perplexing to us. If we could do it, surely ANYONE could, right? And so, we developed this series of articles to tackle what we call the “myths” of family travel – all of those reasons why you “can’t” take a trip like ours are about to go right down the drain. Here we go!! You have to sell your house and all of your belongings or be loaded with cash to undertake a round the world trip. That would be FALSE, my friends! This idea first came about several years ago when I read a book called “One Year Off” by David Elliot Cohen. It tells the story of two parents who take their three children on a one year trip around the globe. It was mesmerizing and inspirational and at once I decided we needed to do it. But here is the thing – we had less than $1000 in savings. We were renting our home. How could we ever come up with the capital to undertake a journey like that?!? And that was the pivotal moment. We could have defeated ourselves right there and moved on to the next seemingly unattainable dream. Or we could get real about what we wanted to teach our kids about big dreams and how to go about making them happen. And so we came up with a plan to cut back on our spending and start saving with an end goal of 9 months abroad. We did all of the standard things that people do – we cut back on eating out, family vacations and movies. Instead we cooked at home, took weekend getaways and watched Netflix. We sold all of the junk in the house and garage that we weren’t using anymore and stopped buying stuff we didn’t need. At one point in time, all three of our cars didn’t total $10,000 in value because we refused to take on a car payment. This is what the kids look like all loaded up with their bags on our travel days. We had hoped it would take us three years to save the money we needed and that because we were renting month by month, we could just terminate our lease and hit the road. And then the unthinkable happened. The perfect little house fell into our laps. It was “just right” for our family in a fairytale kind of way and we fell in love with it immediately, but the clincher was the price. It was CHEAP. And there was no way we would ever be able to find a home we loved as much in the price range we were looking at. I said no. NO NO NO. And my husband, who clearly knows me far too well, took me by the hand and said “I can see growing old with you here”. And so we bought a house. Now we had to decide if we were going to rent it out while we were gone. We were hoping for 9 months away, but our plan had always been to travel until the money runs out and then come home and that is NOT conducive to renting out a home. And so we had to figure a mortgage and basic utility costs into our budget. And three years turned into four. We knew pretty early on that in addition to cutting back and building our savings that we would also be taking some of our retirement money to pay for this trip. It kinda cracks me up how freaked out people get about this. It was a no-brainer for us. First of all, we are young. We have 27 years left to work and can quickly recover those funds. Secondly, we beefed up our contributions when we decided to take the trip so that we were padding those accounts and getting the most out of our employer contributions. And most of all, it was more important to us to use that money now to travel with our kids than to wait until we are retired and travel without them. The future is not guaranteed and there is no telling if either of us will even be in any condition physically to travel at all in 25 years. Why risk it? Why miss out on the opportunity of a lifetime to spend this amazing time with our kids exploring the world? Why indeed!! We are 42 years old. 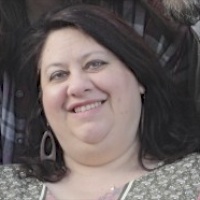 My husband’s mother died unexpectedly at the age of 47. Her death is like a bright star in the night sky reminding us to live in the moment and not take for granted that the future will be what we expect it to be. We were an unlikely family to take a trip such as this. We had little in savings and no equity when we made the decision to chase this dream. Many of our family and friends thought it would never happen. And yet, here we are, in Thailand, having the time of our lives. I love proving people wrong! 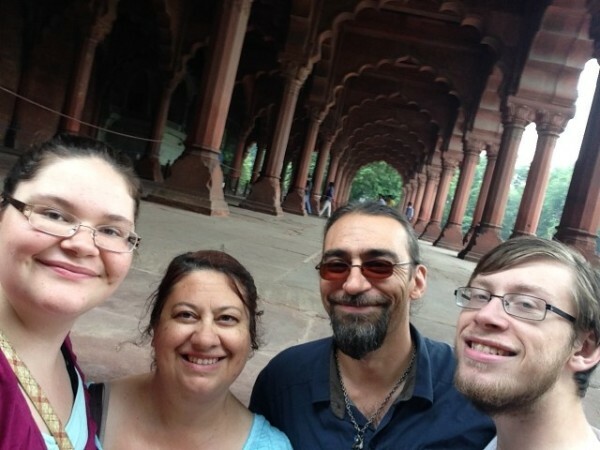 At the Red Fort in Delhi, India. But the bottom line is this – if we can get our nonsense together and save the money to take this adventure, then you can, your best friend can, your co-workers can and that weird neighbor down the road can. It’s a choice you make every moment of every day to prioritize the dream. I can have the Starbucks or I can pay for a meal in Thailand. I can buy these concert tickets or I can pay for a week’s lodging in Cambodia. Every time you chose the dream, you are that much closer to attaining it. It really is just that simple. Staci and her family are currently traveling the world for several months enjoying good food, incredible sites and the best of company. You can follow their madness on www.blameitonmywildheart.com or on Facebook at Blame My Wild Heart. Next month Staci will explore family travel myth #2 by interviewing her children to assure you that they were actually totally excited about this trip and are not being held hostage by their super mean parents who tore them away from their friends to go on a stupid trip around the world. A concern many career break-dreamers face is that they can’t afford to do it. But if you believe enough in your dream, you will find ways to make it happen. It’s all about prioritizing and budgeting: even on a non-profit salary, you can make it happen. Travel requires savings but not much; you can travel for less than you pay on New York rent, and you can always save more by indulging less at home. Money and time are commodities with an inverse relationship, you can only acquire one by spending the other and travel taught me free time is more valuable than additional money. Since I made the decision to travel about a year and a half prior to departure, I was able to properly budget and save for the money I’d need in order to spend a year on the road. And I was definitely not making that much money considering I was paying Manhattan rent and living expense (about $65K – I’m happy to be completely transparent) nor did I have financial help from anyone else. The biggest money saver, honestly, was that I literally stopped purchasing anything frivolous (clothes, shoes, electronics, expensive dinners, etc.) and socked away a percentage of every pay check (including 100% of my annual bonus), cashed savings bonds from childhood, even sold books/CDs on Amazon and most of my furniture on Craig’s List. Amanda, Holly and I also chose to visit predominately third world and developing nations where you can easily live off of $20-$30 per day. Of course traveling as a group definitely helped as everything from lodging, taxis, food and other items (travel guides/books, some toiletries, etc.) could be split up and shared. Other big ways we saved: Round-the-world plane tickets (ours took us from Kenya to Australia – with multiple countries in between for only $2200), eliminating almost all bills/expenses back home (rent, cell phone, electric bills, cable, etc.) 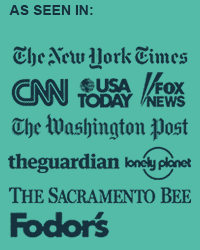 penning the occasional travel article while on the road, crashing at friend’s (or friends of friends) places overseas and keeping costs fixed by doing a structured volunteer program/staying in one location for multiple weeks. 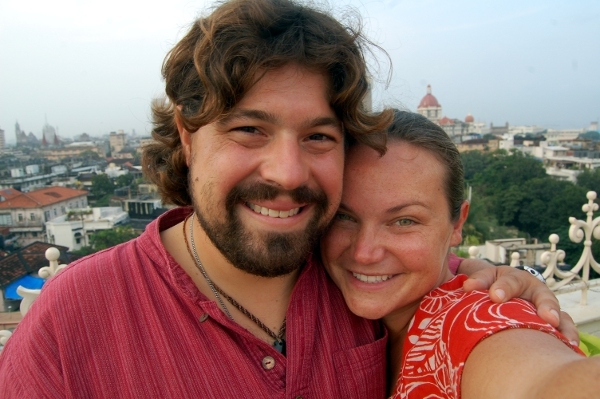 Adam Seper and his wife Megan have embraced travel throughout their decade long relationship. And after getting married, they decided that instead of pursuing the “American Dream” of buying a house and starting a family, they wanted to travel the world instead. So in October of 2008 they set off on a 358-day adventure, visiting 4 continents, 11 countries, and nearly 90 cities. Since they’ve returned, Megan is back being an attorney and Adam has switched careers – from a high school English teacher prior to the trip to editor of BootsnAll. For other couples preparing for an adventure of their own, here are some important insights and tips they learned. If you’ve never taken an extended trip before, you’re bound to have tons of questions. How do we begin planning for something like this? Do we just up and quit our jobs? Is a sabbatical possible? How do we choose where to go? What do we pack? What about visas? Certainly all important questions. But what some fail to think about is what it will actually be like out on the road, especially in regards to traveling with your partner. We heard all the above statements when telling people our plan to take a year-long trip around the world together. We initially dismissed those questions as ludicrous, having confidence in our relationship and previous travels that this whole venture would be a walk in the park. Our trip did indeed include many walks in many parks, but it was hardly the same as the metaphorical meaning of that statement. Something so many people fail to realize about extended travel is that it is really hard work at times. It’s not all puppies, rainbows, and unicorns. We all love vacations. They’re great. Whether it’s lounging on the beach, taking a road trip, or renting a cabin in the woods, vacations give us a chance to get away from the daily grind of life, to forget about our worries for a while, and just relax and unwind. When on vacation, we feel as though we could stay forever. Let’s set the record straight before we delve any further. A career break, RTW (round the world) trip, or taking off on an open-ended adventure is NOT the same as a vacation. We learned quickly that there is a HUGE discrepancy between a vacation and a trip. There are so many things to know, learn, and consider, particularly if you are traveling with your significant other. 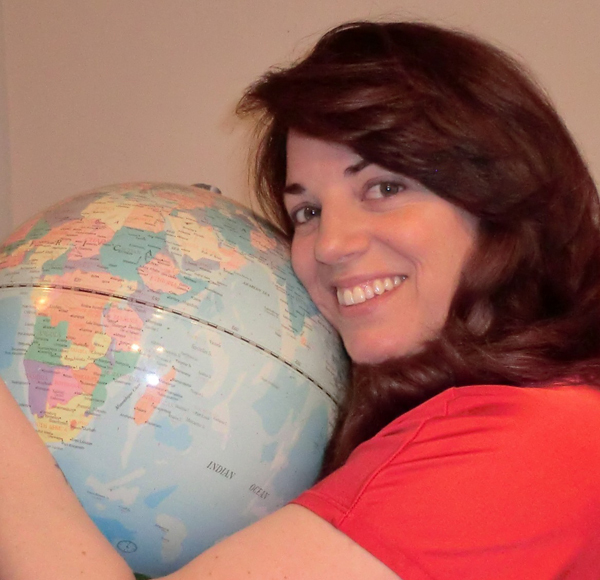 In January of 2012, Jannell Howell will set off on a year-long journey around the world. Her plans will take her West from San Francisco where she’ll travel through Southeast Asia, meander through India and the Middle East, explore Europe and the U.K., check out Morocco, then fly to the East Coast of the U.S. where she’s looking to relocate. Aside from some basic sightseeing and unique activities (e.g. ride an elephant, learn a language, etc), she would like to try working and volunteering overseas, as well as getting to know some locals and a different way of life. Jannell has joined Career Break Basic Training to help with her planning and blogs about this preparation stage on her site Traveljunkies World Tour. Here she shares how her plans are coming along. What inspired you to plan a career break? I knew from an early age that I loved to travel and have gone on some wonderful vacations that allowed me to unplug from reality, but I always longed for more. Wanting to travel around the world has been a dream of mine for a long time, but I never thought I’d get to a point when I had the money or the time to go. Last year, the dream resurfaced as a way to celebrate my 40th birthday in 2012. Then, two weeks later, I attended a Meet, Plan, Go! event that gave me the courage to go for it! What inspired you to join Basic Training? Do you know someone who is planning their escape from the cubicle, or is that someone you? We’ll take you step-by-step through some great holiday gift ideas to help them (or you) on their way. A perfect start to a career break or sabbatical is to successfully negotiate one with your company. Impossible you say? 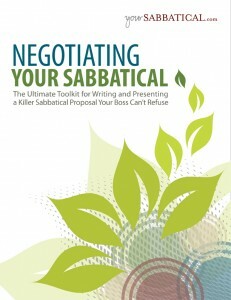 Well Barbara and Elizabeth Pagano are here to help with their eBook: “Negotiating Your Sabbatical: The Ultimate Toolkit for Writing and Presenting a Killer Sabbatical Proposal Your Boss Can’t Refuse”. Now that you’ve decided to go (and not afraid to keep it a secret any longer) say it loud and wear it proud with our very own Briefcase to Backpack-inspired t-shirt. “I Prefer Real Views to Screensavers” – a statement that every career breaker can embrace. 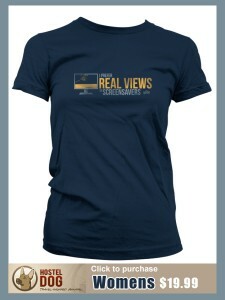 Comes in Mens and Womens sizes. The next step in your career break planning is deciding where to go and what to do! And Career Break Secrets video travel guides are the perfect inspiration source. The Season One pass features episodes in Spain, New Zealand, Patagonia, and Colombia, plus a bonus from South Africa. Now that you are inspired where to go, you’ll want to make sure you capture your memories in the best possible way. 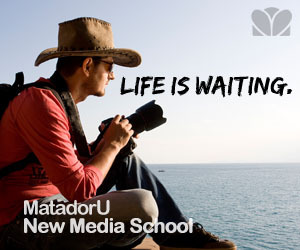 Why not a MatadorU Travel Photography Course or MatadorU Travel Writing Course? If you feel that budding travel writer coming to life, you may consider blogging about your travels. 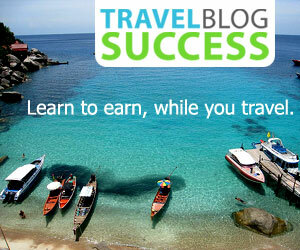 Travel Blog Success will help you build a better travel blog! 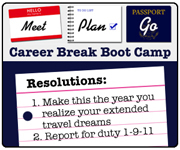 Finally, if you are truly inspired to make your extended travel and career break dreams come true, Career Break Boot Camp can help you get there. Designed by certified travel coach Tara Russell and career break travel gurus Michaela Potter and Sherry Ott, the course will provide you with inspiration, structure, community, resources, tools and motivation. Registration for the January course opens on December 8. So make this your resolution for 2011! Want even more ideas? Visit BootsnAll for their 13 Gift Ideas for Career Break Travelers. Brian Peters of No Debt World Travel has shared with us how he transitioned from Briefcase to Backpack and also offered some great resources in his eBook “No Debt World Travel: The Ultimate Guide to Traveling the World”. He now shares with us the art of booking round-the-world tickets and how you can travel around the world for less than you thought. [singlepic=1779,250,,,right]One thing that stops people from traveling around the world is the PERCEIVED high price of airfare. Going to 5-10 different locations all on one ticket must be super expensive and only for rich folks who have the last name of Trump or Hilton. A round the world ticket can cost LESS that $2500US. A year of Starbucks or cigarettes can pay for RTW air travel. Really. It all depends on the locations you pick and the times of the year you travel. There are two options for purchasing a round the world ticket. It’s easy to think that to travel the world you need to spend a lot of money. And the thought of being able to save enough money can seem daunting. But if you really want to realize your dream, you will find ways to make it happen. [singlepic=1717,200,,,right]That’s what Betsy & Warren Talbot, of Married with Luggage, have done. In two years they have managed to save $100,000 towards their dream travels, enough to live on the road for three years! But it didn’t come easy. Before saving, they recognized the need to get out of the debt they were in. They made radical changes to their lifestyle, including moving across the country, and found creative ways to still have an active social life without breaking the bank. 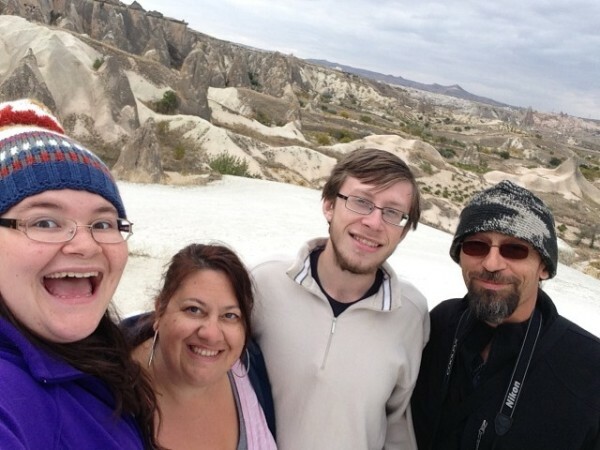 Betsy shares with us why they decided to take a career break, some more insight on how they saved money, and their plans during and after their travels. There is a plethora of information on the web for RTW travel, but Brian Peters has made it easier by putting many great resources in one place with “No Debt World Travel: The Ultimate Guide to Traveling the World”. Brian finally set off on his travels after he was laid off from his job, and a lot of what he learned in preparing and during his six months of travel he shares in this e-book. The decision to take a career break and travel is different for everyone, just as the places you go and the activities you experience will be unique as well. But you can learn a lot from how others made the choices they made. [singlepic=1574,200,,,right]Here Chris Dyer shares with us how he ended up in Changwon, South Korea teaching English after leaving his position as a Brand Manager for a major toy company and selling his house. “I recently decided to give up all of those things to travel the world and experience different cultures. One might call it a “quarter-life crisis”, but I consider my life just beginning. I only have one life and I want to really live it! After researching websites/blogs of people who have completed a round the world trip already, I came to the conclusion that I needed to have $20,000 before I left. I did not live a lavish lifestyle whatsoever, but I still kept a detailed spreadsheet with my debits and credits. Based off my calculations, I could save approximately $1,000 a month as long as no problems arose. Saving a grand a month equated to $15,000 so I decided to get a second job serving/tending bar at a local pub. This would bring in a few extra hundred dollars a month. A few other money saving opportunities were: less clubbing/drinking (huge savings potential), making my own food at home (my average grocery bill was only $50 a month), cancel my 401k and company stock options, and end frivolous spending in general.